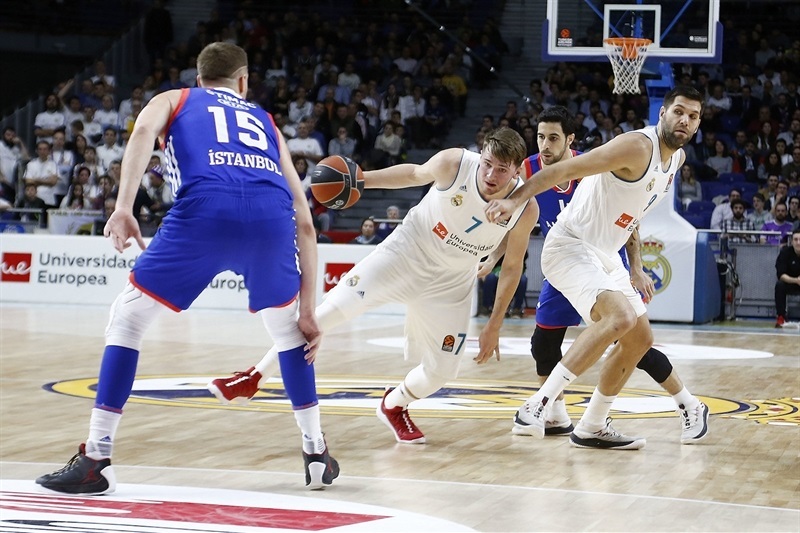 Real Madrid got back to its winning ways with a comfortable 87-68 win over visiting Anadolu Efes Istanbul on Thursday night. 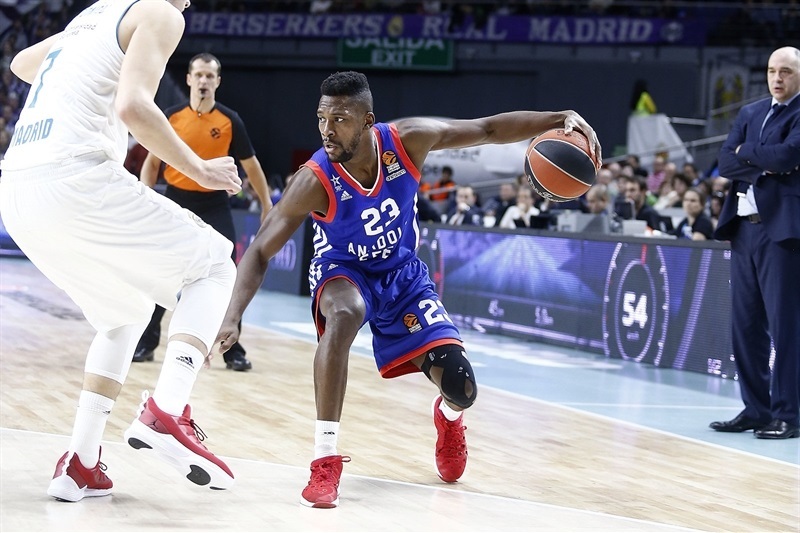 Madrid improved to 13-7 and at least a tie of fourth place in the standings, while Efes dropped to 5-15 and remains in the last place. 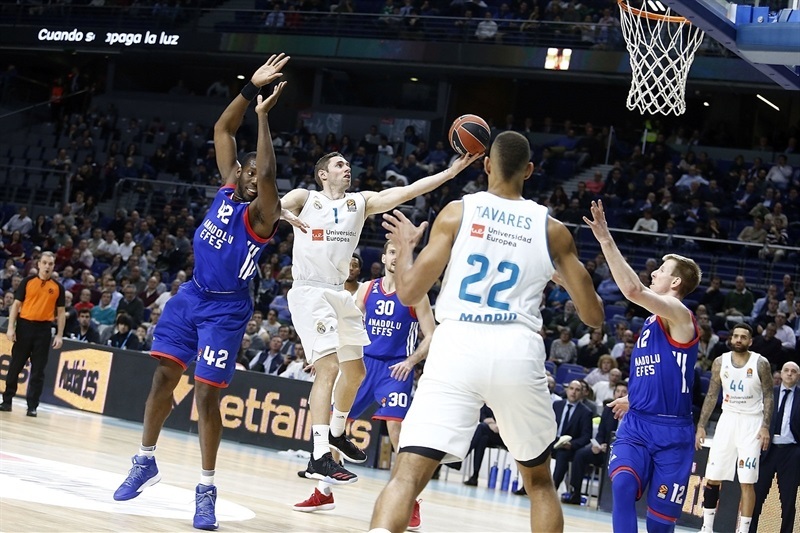 Madrid took control in the final minutes of the first quarter, but did not start to pull away until its offense got into its rhythm in the third. 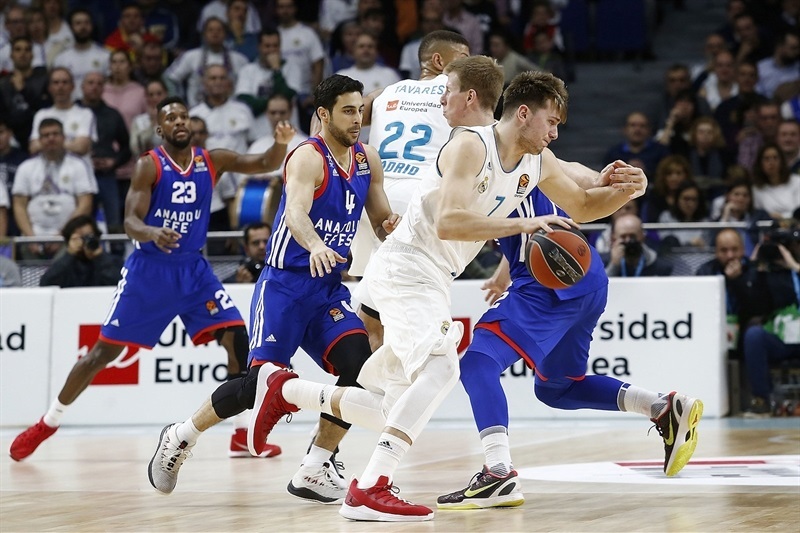 The hosts opened a 57-40 margin in the third stanza and took it to the 20s in the fourth, as Madrid cruised to victory. 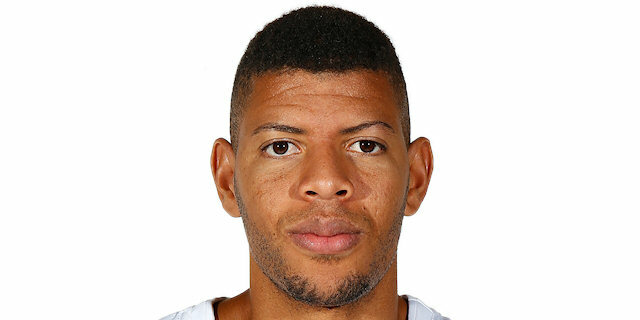 Luka Doncic had 17 points, 6 rebounds and 5 assists in victory, but Walter Tavares was Madrid’s main man on this night with 14 points, 9 rebounds and 4 blocked shots. 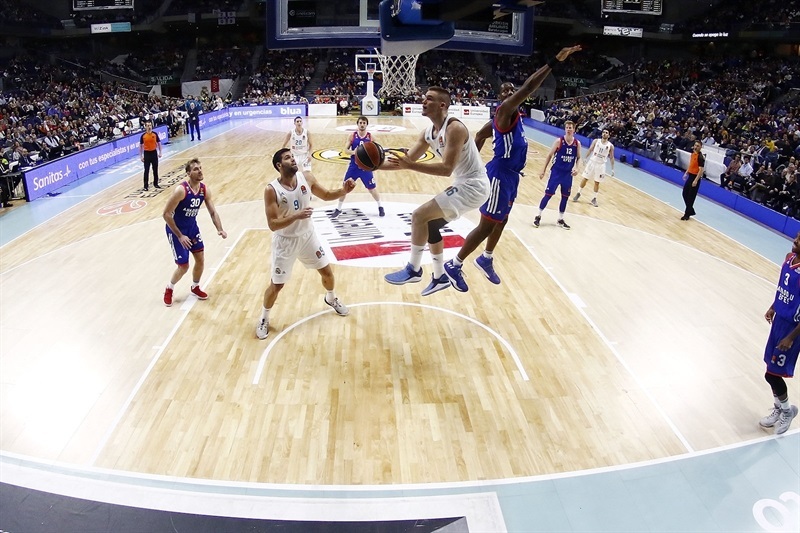 Jaycee Carroll netted 11 points and Felipe Reyes collected 10 points and 7 rebounds in victory. 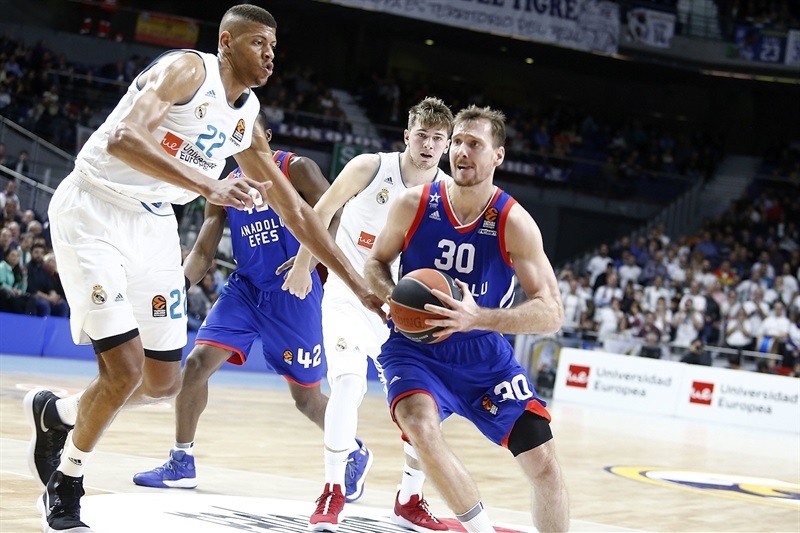 Zoran Dragic scored 18 points for Efes and Derrick Brown finished with 12 in defeat. 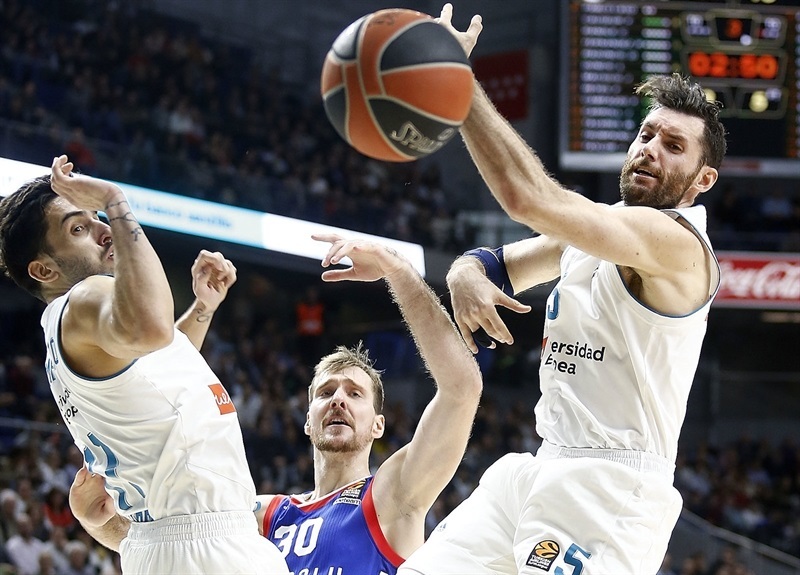 Madrid looked comfortable on offense early with a pair of layups from Fabien Causeur and a triple from Facundo Campazzo. But Brock Motum hit from long range and Dragic scored 6 points in the early going to help the visitors take a 9-11 lead. Trey Thompkins and Jeffrey Taylor hit back-to-back threes, and after Motum and Jonas Maciulis traded three-pointers, Doncic opened his tally with a put-back that made it 20-14 after 10 minutes. 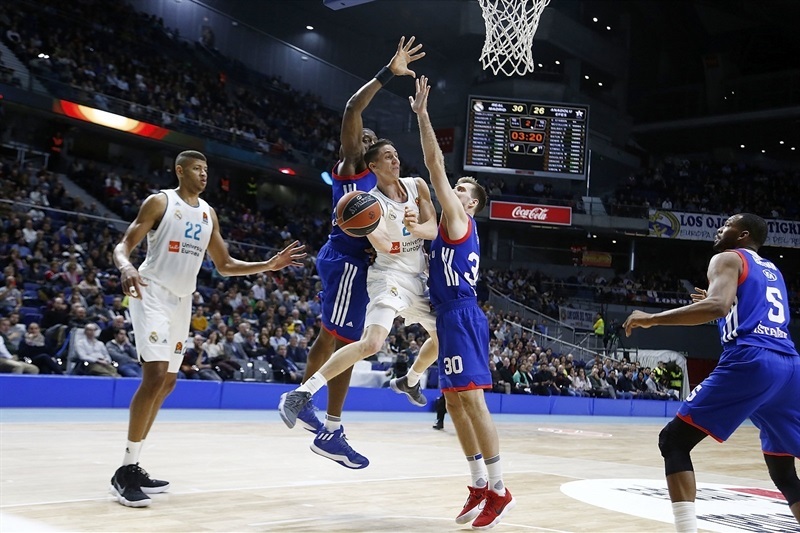 Doncic hit a fadeaway shot, and went coast to coast to make it 28-18 in the second quarter, however, neither team was much into its offensive rhythm. Brown made a floater, Errick McCollum nailed a jumper and Krunoslav Simon worked the low post for Efes to get within 30-26, but Carroll knocked down a three, Tavares added a put-back, and Rudy Fernandez hit a last-second triple to make it 39-30 at halftime. 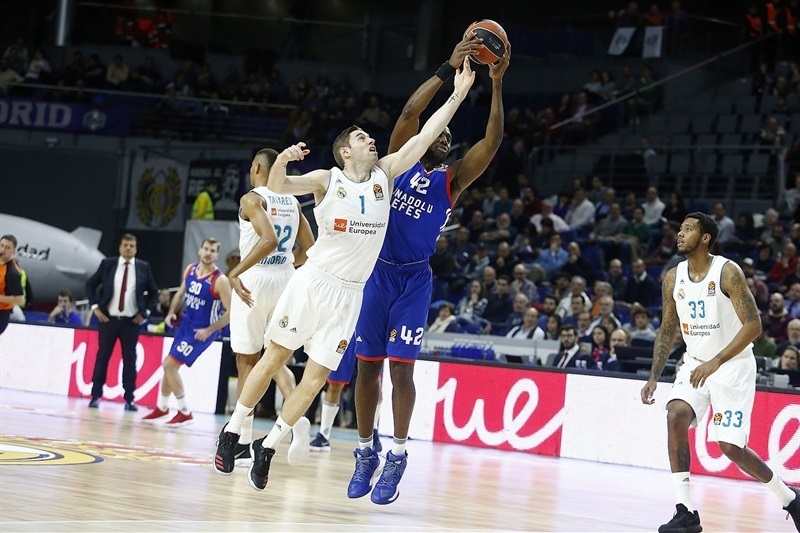 Tavares scored inside and Campazzo went coast to coast, but Brown scored 8 points on the other end, including a couple of triples to keep Efes within 46-40 midway through the third. Tavares kept dominating inside, and Maciulis hit from downtown. 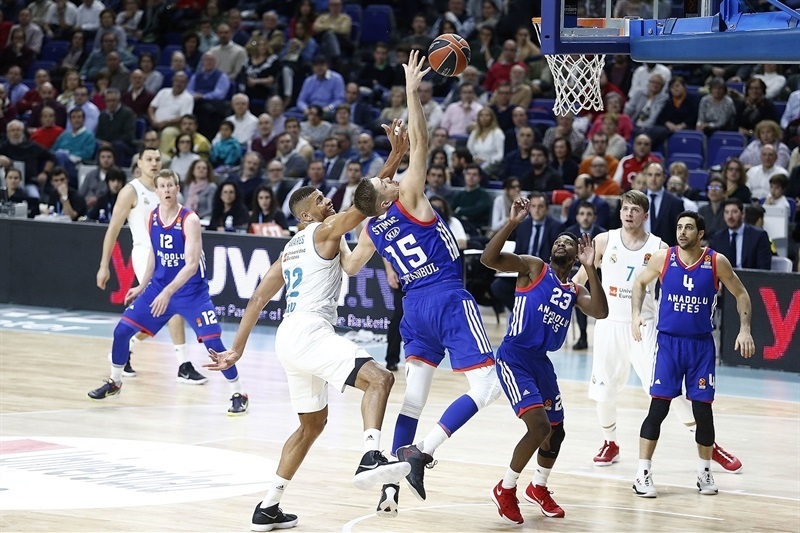 Doncic made a floater, and Campazzo scored on a fast break to open a 57-40 margin. Dragic had a triple and a fastbreak layup on consecutive possessions that helped the visitors stay within 60-47 after three quarters, and a jumper from Toney Douglas made it 63-51 early in the fourth. 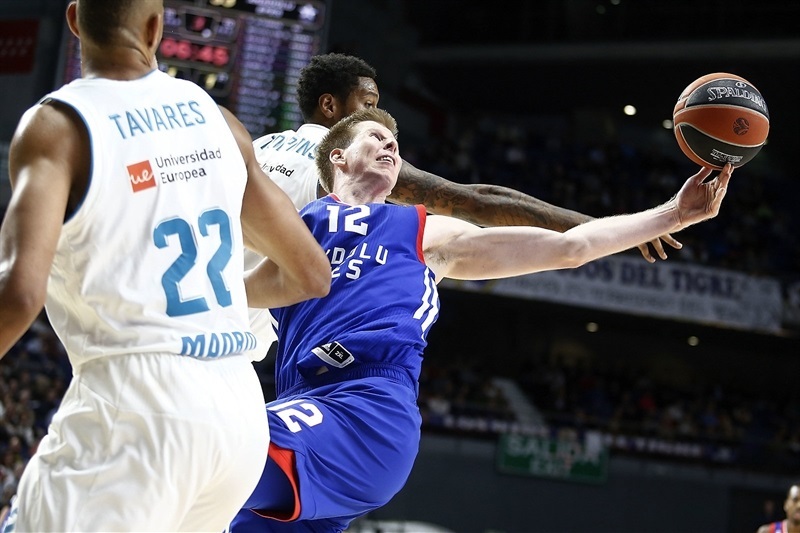 But Doncic and Carroll made foul shots and Reyes scored inside, before Carroll and Doncic connected from downtown to extend it to 75-54. 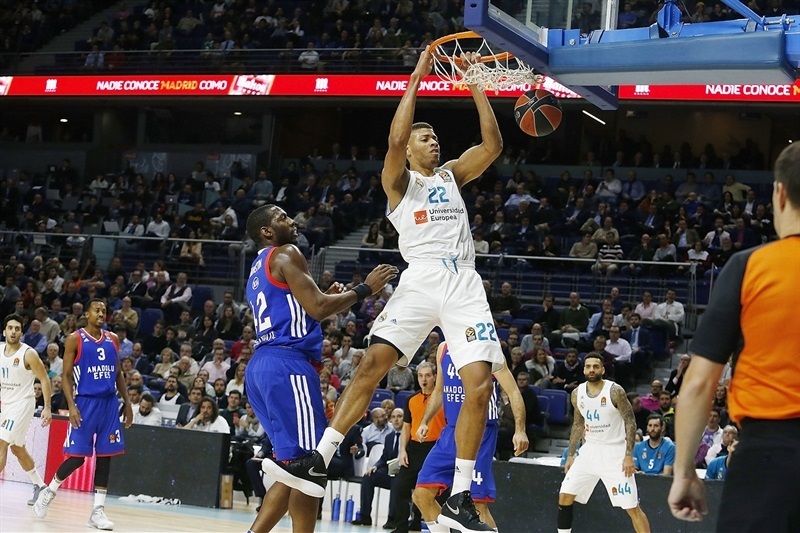 With Madrid in control and with a big lead, the defensive intensity eased up in the final five minutes as the hosts cruised to victory. "First I want to congratulate the team for the win. I think it was a quite a solid game both from the offensive and defensive points of view. If there is a ‘but’, it would be the turnovers we had and unnecessary mistakes. But we controlled the rebounds and the pace of the whole 40 minutes. We won all four quarters. Luka Doncic could not practice until yesterday, was sick, and we did not know if he will be able to play. I think the team responded quite well and we were able to get a win, which is always difficult in the EuroLeague. This is a competition where each game is quite demanding, and I think we are still in a position where we still have to secure our place in the playoffs, which is not easy." "We had a problem with defending Tavares, especially after Dunston got into foul trouble and our defensive quality dropped off. On offense we planned to take more mid-range shots and three-pointers, and not attack Tavares inside. But we missed a lot of shots in the first half. In the second half we tried to mismatch him with Derick Brown. Some minutes we had success, but we had problems defending him under our basket. 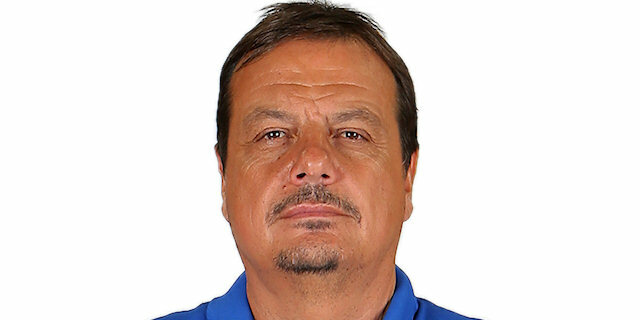 After Doncic started playing effective, our defensive level went down again, and we lost the game. Tavares destroyed our balance. Dunston struggled to find his pick-and-roll offense in the first half, and on defense too. I think Tavares did a great job in the game tonight." "The key was the energy. We kept up with the energy from beginning to the last minute. That was the key, and our good and aggressive defense. This is probably my best game in the EuroLeague, it is my first season. We are happy we got this win."